Medium format quality in a DSLR body - too good to be true? The Leica S2's compact design allows for medium-format shooting in the field. Twenty grand is a lot of money. By today's prices that will buy you a brand-new Mini Cooper, a deposit on a house, or even a university education. With £20,000 you can buy a lot of camera kit, too: a pair of Nikon D3X bodies with 14-24mm f/2.8, 24-70mm f/2.8 and 70-200mm f/2.8 lenses plus an Apple MacBook Pro, 27-inch screen and the whole Adobe Creative Suite doesn't come to that much. But what if you could also spend this princely sum on just one camera body and a standard lens. Would you? That's about what the Leica S2 costs when paired with with its standard lens, the Summarit 70mm f/2.5. The Leica S2 is a medium-format camera, meaning its sensor is bigger than you'd find in a full-frame DSLR – 56% bigger in this case. There are many other medium-format cameras on the market of course (all of them expensive), but when Leica came to the table with the S2 it wanted to offer something different. The trouble with medium-format cameras is their size and weight. The famous Mamiya RB and RZ series of cameras, as well as Hasselblad's legendary V-system, have been professional workhorses for years, but you wouldn't want to sling one over your shoulder and use it to shoot travel photography in an Indian marketplace. The Leica S2 is different, being smaller than the aforementioned Nikon D3x and any of the Canon EOS-1D series cameras, despite housing a 45x30mm, 37.5-megapixel sensor. Other medium-format manufacturers have also made efforts to make their cameras more portable and better handling: Hasselblad's H system is currently in its fourth iteration with the H4D series, and Mamiya has seen its 645 AFD III camera become more user friendly under the company's new owners Phase One. Pentax has also arrived with its 645D medium-format camera, bristling with user-friendly automated features. 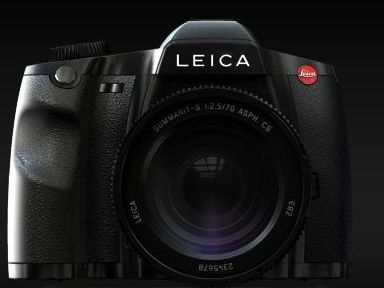 When compared to the competition, the Leica S2 is the most integrated system of all (some medium format camera have two sets of controls and batteries - one for the camera and the other for the digital back), and has the advantage of being built new from the ground up – no legacy lens designs here to compromise performance. As with other Leica digital cameras, the company decided to use DNG as the S2's raw file format, which, on balance, was a good decision. This enables users to process the S2's raw files through any version of Adobe Camera Raw they like, as well as to shoot straight into Adobe Lightroom (tethered or by memory card). In fact, Leica supplies a copy of Lightroom as standard with the camera. DNG is also read by Phase One's Capture One software and Hasselbald's Phocus, so owners of these packages don't have to learn a new set of tricks. Thanks to a Leica-produced application called Image Shuttle, users can shoot tethered straight into Capture One by making use of hot folders. This approach to digital workflow makes this the most flexible medium-format camera out there when it comes to software. When looking down the specification of a camera like this, many mid-range or entry level photographers may wonder what all the fuss is about. Currently fashionable features, like HD video, scene modes and picture styles are nowhere to be seen. Leica is aiming squarely at the top end of the professional market with this one, with features like a dual-shutter system. With compatible lenses, this allows you to select the camera's built-in focal plane shutter for speeds of 8secs to 1/4000sec with flash sync at 1/125sec, or the lens' built-in leaf shutter for flash sync all the way up to 1/500sec. As we will see, though, the S2 is not designed to compete with Canon and Nikon's professional cameras, and is certainly not meant to be a panacea, replacing all of your needs with just one camera body.